Do you ever wonder how you can receive two firsts and a gate in a class at the horse show? It happens quite commonly yet always creates a bit of a stir. Most of the time the odd judge is thought to have “missed” something. But more often than not, the odd judge did not miss something but rather saw something that others did not. Riding on both sides of the fence, I have been the odd judge who saw or missed something and the exhibitor whose mistake was seen by one but not by all. And after my initial disappointment by not receiving a clean sweep, I remember the far corner where I had an ugly departure I thought no one saw and must acknowledge my performance was less than perfect. Most of the time now I am the one in the center of the pen who misses or catches – sometimes it makes me the odd judge and sometimes my scores match my peers. Regardless of the outcome, judges mark what they see and what they see influences how they score the performance. It is not uncommon for judges to place more emphasis on one aspect of a performance over another. For instance, in showmanship, I think the most important part of the performance is tracking and setting your horse up straight in front of the judge. If an exhibitor misses their line and is off, their score is going down on my card. However, if one judge is sitting three chairs away from the steward who is walking the class, viewing the performance from an angle, they will not be able to see if the exhibitor is getting straight to the steward. Unless the horse is standing sideways, the judge viewing from an angle will not able to place a great deal of importance on straightness. Lining up in front of the steward is important to me so you will always see me sitting as close to the steward as I can without interfering in the exhibitors’ performance. It is human nature to remember the good over the bad, the positive aspects over the negative aspects of our performances. Judges’ results and scores reflect their view of a performance from the judges’ unique perspective based on their vast experience. A judge that has experienced a horse trip and fall resulting in an ambulance ride may fault your horse for tripping more than the judge who has never experienced a wreck caused by a horse stumbling. That is what makes it so dang cool to receive high marks on all the judge’s scorecards. It is truly impressive when an exhibitor can positively impact multiple opinions with one single performance. Keep at it and that exhibitor will be you! This entry was posted in Show Ring Tips and tagged Judging Opinion on May 20, 2015 by Stephanie Lynn. Until last night, I had never heard of John Legend. An award winning singer, songwriter and musical genius he is making the rounds as an Oscar nominee for a recent collaboration with rapper Common for the song “Glory”. His list of accolades is long and his success evidenced by his popularity. But a statement made by Legend stopped me in my dinner table setting tracks and made me listen. In a talk show appearance he told the hosts that as a kid he watched Michael Jackson and Prince on stage during the Grammy’s and thought one day he ought to be up there too. He has now won nine Grammy’s. This entry was posted in Building Success, Show Ring Tips and tagged focus, future, Winning tips on January 21, 2015 by Stephanie Lynn. It’s New Year’s! Time for celebration, forward looking and resolutions most will unfortunately never fulfill. Personally I do not make New Year’s resolutions. Don’t get me wrong – I reflect on my past successes and failures, consider changes I want to make, set new goals and contemplate my purpose. But it is an ongoing exercise – something I do more than just when the calendar turns. Perhaps it is because I am slow or dense. Or maybe it is because I think too much. Whatever the reason, breaking each goal down into smaller steps makes achieving any goal easier. Use your goals as a reference to decide how to live each day. 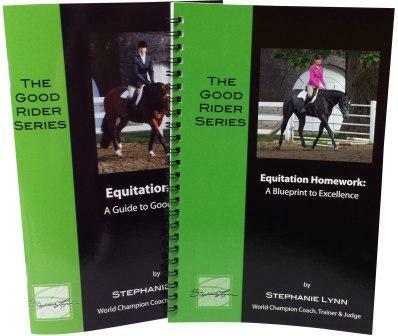 This entry was posted in Building Success, Show Ring Tips and tagged baby steps, horse show, Resolutions on January 1, 2015 by Stephanie Lynn. 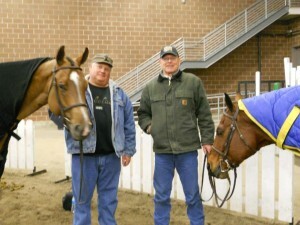 Showing horses is not just fun – it offers more opportunities than any sport I know of to build character. For one thing, I cannot think of a sport more humbling than showing horses. You can have a great ride and feel on top of the world as you win or hear your name called out. And the very next step, your horse can spook and toss you like a bad chip. Or, as happens to the majority here in Columbus, Ohio, you show all year at home winning with ease preparing for this one big horse show called the Congress. You diligently practice, doing your homework, preparing for this one big event. Then, when the day arrives, you and your horse perform flawlessly, doing everything exactly as you practiced – yet you do not make the split. This entry was posted in Building Success, Show Ring Tips on October 17, 2014 by Stephanie Lynn. 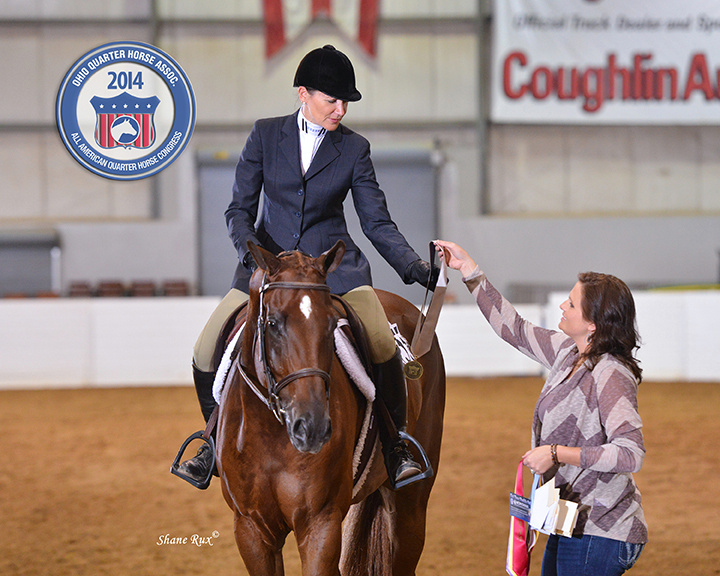 Do you wonder what criteria judges use to make decisions in the show ring? Everyone has heard the phrase “you never get a second chance to make a first impression” but it might surprise you to learn the powerful effect that anchoring has on judges. Anchoring is the term used to describe people’s tendency to rely too heavily on the first piece of information they receive. For instance, a rider enters the arena looking down at their horse’s head, leaning forward or continuously looking toward the judge. The judge’s immediate opinion is that this rider is worried, does not trust their horse or is about to make a correction. With only seconds to evaluate each pair, the judge perceives this pair as insufficient and quickly looks beyond the pair in search of the winners. This entry was posted in Building Success, Show Ring Tips on August 7, 2014 by Stephanie Lynn. Parents play the most important role in developing young riders. Parents do much more than haul their sons and daughters to lessons, arrange rides to and from the horse show and provide necessities. They are more than cheerleaders or providers, they nourish and shape children in their fold. 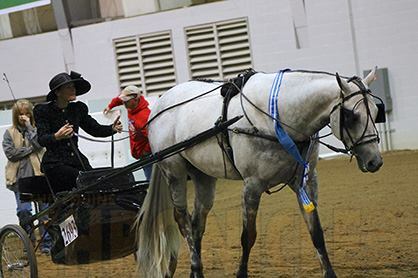 Regardless of their level of involvement, parents are often the driving force behind a young rider’s ability to handle the pressures of competition. It is wonderful to see parents take an active role in their child’s horse hobby and encourage their son or daughter’s progress. However, parents walk a fine line between encouraging their children to achieve and pushing too hard. If you are an adult with influence over a child’s riding and showing, here are some tips to improve the experience. 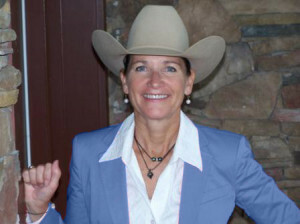 This entry was posted in Building Success, Show Ring Tips on July 31, 2014 by Stephanie Lynn. 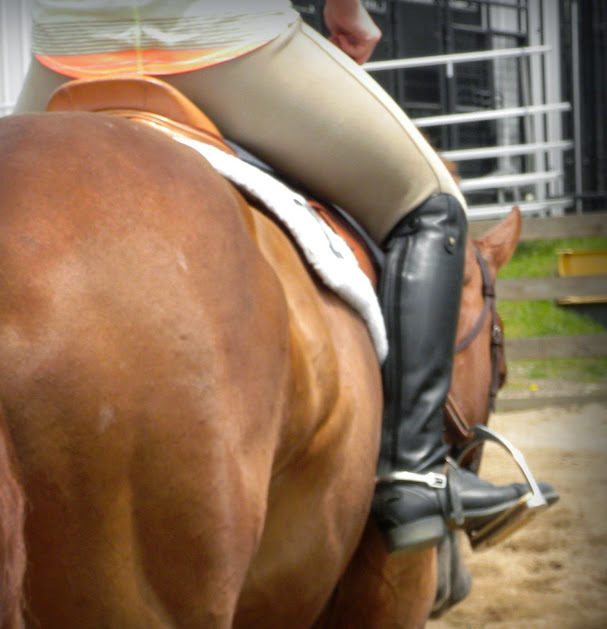 Everyone experiences horse show jitters at some point in their riding career. 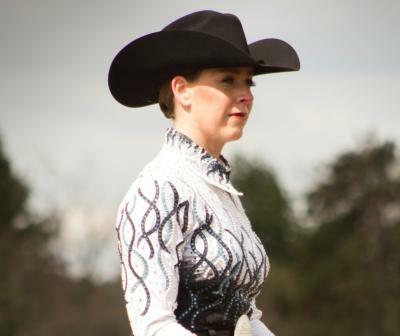 It is only natural to feel some anticipation and excitement before stepping into the show pen. In fact, it is the rush of showing that gets you out of bed at 4 a.m. But if you are going to be truly competitive, you will have to learn to get a handle on your nerves. Acknowledging your nerves is the first step to overcoming your nerves. Here are some tips to help you master your nerves. 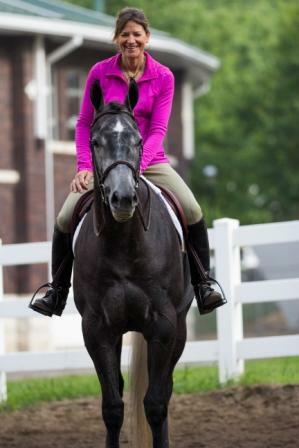 This entry was posted in Show Ring Tips on July 23, 2014 by Stephanie Lynn. Get your heels down. You have heard those words a thousand times before and will continue to hear them as long as you are a student of horsemanship. Your heel is your base, the lowest point of your foundation – that upon which everything else is built. When your horse comes to a screeching halt in fear of the flapping flags, better have your heels down. If you want to create inertia, when your horse needs a little extra oomph in his step; better have your heels dug deep in your stirrup. And similar to the idiom discussed last week, digging in means more than just getting your heels down. Just as Tiger Woods practices his swing on the driving range for 2 or more hours per day, you must practice drills to keep your base strong. That means a lot of time in the saddle standing in your stirrups, in a two-point or forward position stretching and strengthening your lower leg. 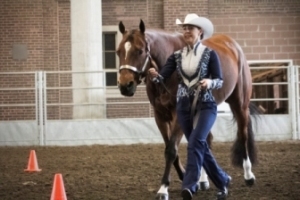 The flexibility and strength in your ankle and lower leg is the key to a good connection with your horse. You cannot be a great rider without being connected – at all times – to your horse. All good connections start at the bottom, with your base. When times get tough, it is this base that will keep you anchored on a successful path. This entry was posted in Show Ring Tips on February 19, 2014 by Stephanie Lynn. Keep your chin up! Literally and figuratively riders need to keep their chin up. 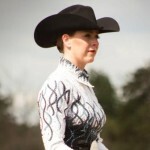 Judges can tell an exhibitor’s demeanor from the slant of the rider’s head. Confident riders look ahead. 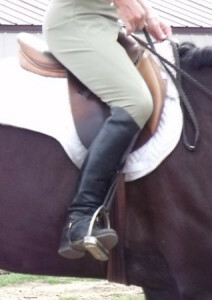 Insecure riders often look down frequently or focus on the horse’s head. The eyes forewarn the judge of corrections just made or convey the concern for danger ahead. None the less, downcast eyes tip your hand and alert the judge to your apprehension. Judges will look elsewhere for their winner. This entry was posted in Show Ring Tips on February 12, 2014 by Stephanie Lynn.